North America In-vitro Diagnostics Market share was valued at USD 26.6 billion in 2017 and is expected to witness growth of around 5.6% CAGR from 2018 to 2024. Increasing geriatric population preferring personalised medicines will boost North America in-vitro diagnostics market growth. Geriatric population in the U.S. is around 46 million that is forecasted to double by 2060. Majority of geriatric population suffers from infections caused due to cancer and other viral diseases escalating the demand for in-vitro diagnostic devices in upcoming years. Introduction of advanced technology within the medical diagnostic devices will have a positive impact on in-vitro diagnostic industry growth. Better precession analytical instrument improves analysis and diagnostic decisions required during surgery thereby will stimulate market growth in the forthcoming years. However, high costs associated with diagnostic procedures can hamper the industry growth. Reagents & kits segment held USD 5.3 billion in 2017 and will grow at considerable rate over the forecast timeframe. Rising prevalence of rare disorders should foster segmental growth. There are around 7,000 types of various rare genetic disorders and around 30 million Americans suffer from these disorders that will create a hike in demand for reagents and clinical chemicals. Thereby, will stimulate in-vitro diagnostics industry growth. Services segment is expected to grow at 5.8% during the estimated timeframe. In-vitro diagnostics service demand will grow due to increasing prevalence of chronic disorders requiring continuous monitoring. Also, availability of skilled technicians will improve the quality of diagnostic services offered elevating the segmental growth in the near future. Microbiology segment accounted for 5.8% revenue share in 2017. Increasing prevalence of bacterial, viral and fungal infections will stimulate demand for in-vitro diagnostic procedures. Moreover, technological advancements incorporated in microbiology diagnostic devices will upsurge its preference over the conventional devices available thereby will escalate the segmental growth. Infectious disease segment was valued at USD 6.2 billion in 2017 as a result of growing prevalence of infectious diseases. According to CDC, in 2014 there were 51,455 cases of salmonella infections in the U.S. that should have a positive impact on the demand for in-vitro diagnostics. Furthermore, rising rate of fungal skin infections in North America will influence in-vitro diagnostics market growth. Laboratories segment held an enormous revenue share of 29.3% in 2017 and is expected to have similar growth trends over the forecast timeframe. Escalating demand for pathological services will drive the segmental growth. Also, increasing prevalence of gastrointestinal diseases will upsurge demand for diagnostic services at laboratories. For instance, percentage of gastrointestinal diseases is highest in U.S. as compared to other countries that should enhance the business growth in upcoming years. Canada in-vitro diagnostics market was valued USD 2.7 billion in 2017 and is expected to grow in the upcoming years. 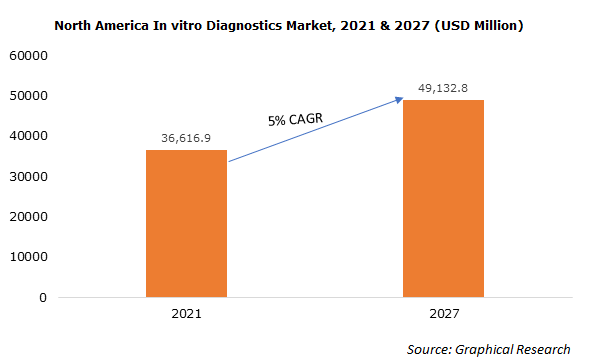 Growing geriatric population, higher adoption rate of automated diagnostic device along with growing levels of disposable income will further propel in-vitro diagnostics industry growth. Key industry players operating in in-vitro diagnostics industry is Abbott, Becton Dickinson, BioRad, BioMerieux, Cephied, Danaher, Grifols, Johnson & Johnson, Luminex, Roche Diagnostics, Siemens, Sorin, Thermo Fisher and Qiagen. These players adopt various strategies such as new product launch, merger and acquisitions that will render them with enormous growth opportunities. For instance, in May 2018, Abbott announced its new product launch of Afinion 2 analyzer rapid test system for diabetes management, thereby strengthening its product portfolio. North America in-vitro diagnostics market is highly regulated; restraining entry of new entrants in the market giving it a consolidated nature. Higher income levels in U.S. and Canada will increase adoption rate of technologically advanced medical diagnostic devices that will upsurge industry growth in upcoming years. Also, key industry players will incur sustainable profits due to introduction of new technology within devices directly influencing the North America in-vitro diagnostics growth positively in upcoming years.